The Italian authorities have seized assets worth 1.3bn euros ($1.7bn: £1.1bn) from a Sicilian businessman involved in renewable energy. Investigators allege that Vito Nicastri was a front man for the Mafia, or Cosa Nostra, investing illegal earnings in his business empire. The anti-mafia agency said in a statement it was the biggest ever seizure of mafia-linked assets. Mr Nicastri has been confined to his home town as investigations continue. The 57-year-old's assets include 43 wind and solar energy companies and 98 properties. So heavily was Mr Nicastri involved in renewable energy, Italian media dubbed him the "Lord of the Wind". Arturo de Felice, head of the anti-mafia agency, said: "This is a sector in which money can easily be laundered." Mafiosi constantly seek to penetrate areas of legitimate business activity, the BBC's Alan Johnston reports from Rome. Not only are they drawn by the profits that can be made in normal trading but they can also use their connections in these areas to launder money that they have made elsewhere in illegal activities such as extortion or drug-trafficking, he adds. 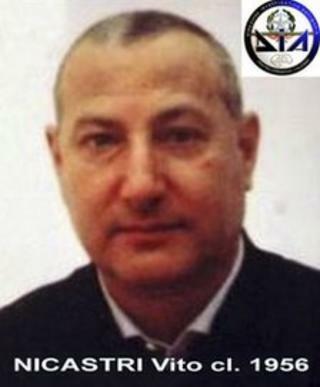 Investigators said the businessman from Alcamo, in western Sicily, had ''maintained constant relations with members of Cosa Nostra'' in Sicily, as well as having contacts with the 'Ndrangheta mafia in Calabria, on the Italian mainland. This relationship allegedly ''facilitated his transformation from an electrician into a businessman specialising in the production of electricity from renewable sources, giving him a prominent position in the south", Italy's Ansa news agency reports. Police and magistrates said Mr Nicastri was linked to alleged top Sicilian Mafia boss Matteo Messina Denaro, who is a fugitive from the law. The businessman has been put under surveillance in Alcamo, where he must regularly sign in at police stations. The seizure "impacts in a significant way on the economic power of Matteo Messina Denaro, who is considered the lord of that land [Sicily]", the anti-mafia agency said. Ivan Lo Bello, vice-chairman of business lobby Confindustria, wrote on Twitter: "Matteo Messina Denaro is behind many businessmen considered above suspicion who manage and take care of the assets of the real boss of Cosa Nostra. "To defeat the Mafia, the fight against money-laundering is fundamental."